P&O Cruises | Frequently Asked Questions | Meet The Fleet - What do the obstructed views look like on Azura? You are here: Home > Advice centre > Obstructed Views > What do the obstructed views look like on Azura? Q. 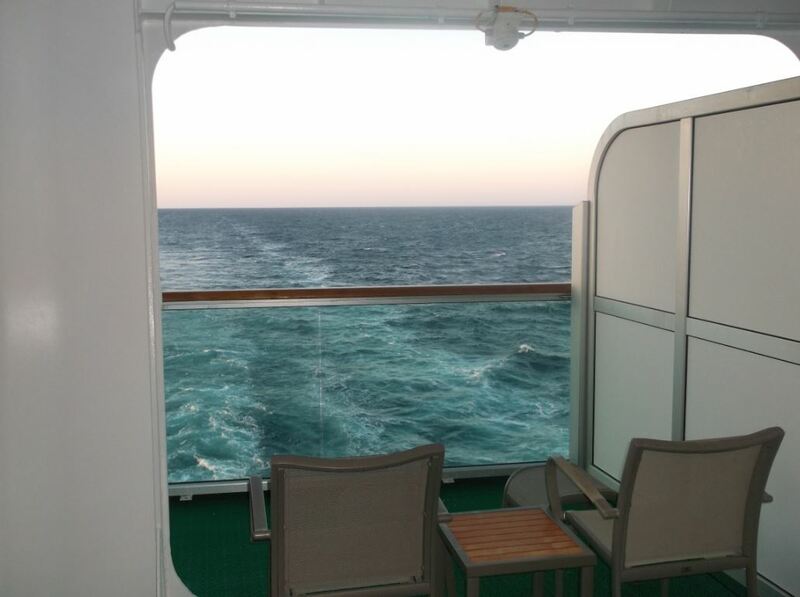 What do the obstructed views look like on Azura? 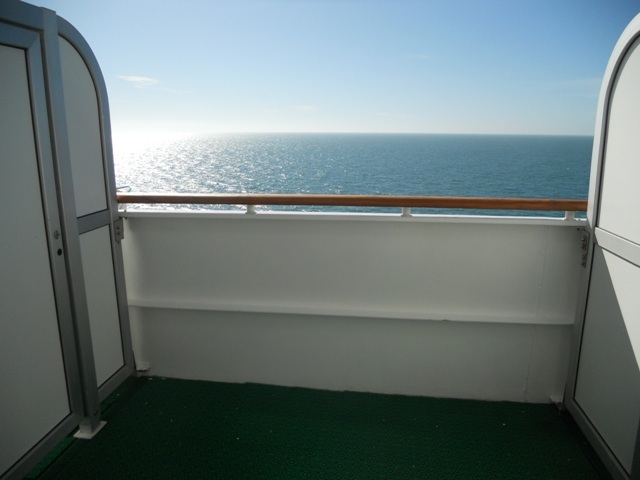 Please note that cabins on the opposite side of the ship will have the same obstruction, for example, to see the obstruction from E603, view the picture for E604. L101 - Ship structure at the front of the ship. L102 - Ship structure at the front of the ship. A753 view 1, A753 view 2 - Ships structure running through the middle of the balcony. B751 view 1, B751 view 2 - Ships structure running through the middle of the balcony. C99 view 1 C99 view 2. There is a structural pillar which supports the bridge on the side of the balcony. This obstructs the view when looking forward. C100 view 1 C100 view 2. There is a structural pillar which supports the bridge on the side of the balcony. This obstructs the view when looking forward. C750 view 1, C750 view 2, C750 view 3 - Ships structure running through the middle of the balcony. D105 view 1, D105 view 2 - Curved balcony, ship's bow visible. D106 - Curved balcony, ship's bow visible. E101 - Mostly shaded balcony but with big open window in top half of the view. E102 - Mostly shaded balcony but with big open window in top half of the view. E106 - Mostly shaded balcony but with big open window in top half of the view. E110 - Mostly closed in balcony but with big open window. E114 - Mostly closed in balcony but with big open window. E118 - Mostly closed in balcony but with big open window. E120 - Left hand side blocked by life boat and right hand side blocked by chains and structure holding boat in place. E202 - Lifeboat blocking bottom half of view. E204 - Lifeboat blocking just over half of view from bottom up. E206 - Right hand side blocked by life boat and left hand side blocked by chains and structure holding boat in place. E208 - Vertical poles all across the view and some safety equipment but large gaps allow natural light in. E210 - Bottom left obstructed by life boat and right hand side has chains and structure to hold the boat in place. E212 - Bottom half obstructed by life boat. E214 - Bottom half obstructed by life boat. E216 - Right hand side obstructed by life boat and left hand side has chains and structure to hold the boat in place. E218 - Safety equipment and poles all across the view but large gaps allow natural light in. E220 - Pole through centre, lifeboat at bottom half of view and chains. E222 - Bottom half obstructed by life boat. E224 - Bottom half obstructed by life boat. E226 - Life boat on right hand side and safety equipment on the left but large gaps allow natural light in. E228 - Life boat in bottom left hand corner and structure holding it in place to the left. E230 - Bottom half obstructed by life boat. E306 - Bottom left obstructed by life boat and top right is ship's equipment and chains. E308 - Bottom half obstructed by life boat. E312 - Bottom half obstructed by life boat. E314 - Right hand side obstructed by life boat and left hand side has chains and structure to hold the boat in place. E318 - Bottom left obstructed by life boat and top right is ship's structure and chains. E320 - Bottom half obstructed by life boat. E322 - Bottom half obstructed by life boat. E324 - Right hand side obstructed by life boat and left hand side has chains and structure to hold the boat in place. E326 - Safety equipment and poles all across the view but large gaps allow natural light in. E328 - Safety equipment and access points cover the left and lower part of the view. E330 - Rear end of rescue boat obscures the middle of the view. E408 - Safety storage area obscures a majority of the view. E410 - Safety storage area obscures a majority of the view. E418 - Lots of thin white poles across all of view but with large gaps to allow natural light in. E420 - Bottom left obstructed by life boat and right hand side obstructed by ship's structure and chains. E422 - Bottom half obstructed by life boat. E424 - Bottom half obstructed by life boat. E502 - Right hand side obstructed by life boat and left hand side has chains and structure to hold the boat in place. E503 - Left hand side obstructed by life boat and right hand side has chains and structure to hold the boat in place. E504 - Bottom right obstructed by life boat and top right obstructed by ships structure and chains. E505 - Bottom half obstructed by life boat. E506 - Bottom half obstructed by life boat. E507 - Bottom half obstructed by life boat. E508 - Bottom half obstructed by life boat. E509 - Left hand side obstructed by life boat and right hand side has chains and structure to hold the boat in place. E510 - Bottom right obstructed by life boat and left obstructed by ship's structure and chains. E511 - Right hand side obstructed by life boat and left hand side has chains and structure to hold the boat in place. E512 - Bottom left obstructed by life boat and other areas obstructed by ship's structure, chains and wires. E514 - Most of view obstructed by life boat although there is a gap in the top right corner. E515 - Most of view obstructed by life boat although there is a gap in the top left corner. E516 - View fully obstructed by life boat. E517 - View fully obstructed by life boat. E518 - View fully obstructed by life boat. E519 - View fully obstructed by life boat. E520 - Right half obstructed by lifeboat and ship's structure, some of the left side obstructed by metal safety equipment. E521 - Left half obstructed by lifeboat and ship's structure, some of the right side obstructed by metal safety equipment. E601 - Right half obstructed by lifeboat and ship's structure, some of the left side obstructed by metal safety equipment. E602 - Left half obstructed by lifeboat and ship's structure, some of the right side obstructed by metal safety equipment. E603 - Most of view obstructed by life boat although there is a gap in the top left corner. E604 - Most of view obstructed by life boat although there is a gap in the top right corner. E605 - View fully obstructed by life boat. E606 - View fully obstructed by life boat. E607 - View fully obstructed by life boat. E608 - View fully obstructed by life boat. E609 - Left half obstructed by lifeboat and ship's structure, some of the right side obstructed by metal safety equipment. E610 - Right half obstructed by lifeboat and ship's structure, some of the left side obstructed by metal safety equipment. E611 - Left half obstructed by lifeboat and ship's structure, some of the right side obstructed by metal safety equipment. E612 - Right half obstructed by lifeboat and ship's structure, some of the left side obstructed by metal safety equipment. E614 - Most of view obstructed by life boat although there is a gap in the top right corner. E615 - Most of view obstructed by life boat although there is a gap in the top left corner. E616 - View fully obstructed by life boat. E617 - View fully obstructed by life boat. E618 - View fully obstructed by life boat. E619 - View fully obstructed by life boat. E620 - View fully obstructed by life boat. E621 - Right half obstructed by lifeboat and ship's structure, some of the left side obstructed by metal safety equipment. E622 - Left half obstructed by lifeboat and ship's structure, some of the right side obstructed by metal safety equipment. E623 - Right half obstructed by lifeboat and ship's structure, some of the left side obstructed by metal safety equipment. E624 - Bottom half of view is obstructed by the life boat. E625 - Bottom half of view is obstructed by the life boat. E626 - Bottom half of view is obstructed by the life boat. E627 - Bottom half of view is obstructed by the life boat. E628 - Right half obstructed by lifeboat and ship's structure, some of the left side obstructed by metal safety equipment. E629 - Left half obstructed by lifeboat and ship's structure, some of the right side obstructed by metal safety equipment. E630 - Metal pole running down the middle and some wires and safety equipment to the right of the view. View is largely unaffected. E631 - Metal pole running down the middle and some wires and safety equipment to the left of the view. View is largely unaffected. E703 - Ship structure obscures a small part of the upper and right hand side of the view. E705 - View almost completely obstructed by storage area. E706 - View almost completely obstructed by storage area. E707 - View almost completely obstructed by storage area. E708 - View almost completely obstructed by storage area. E709 - Railings cause a minor horizontal obstruction to the view. E710 - Railings cause a minor horizontal obstruction to the view. E732 - Ship's structure runs through the middle of the balcony. E734 -Ship's structure runs through the middle of the balcony. 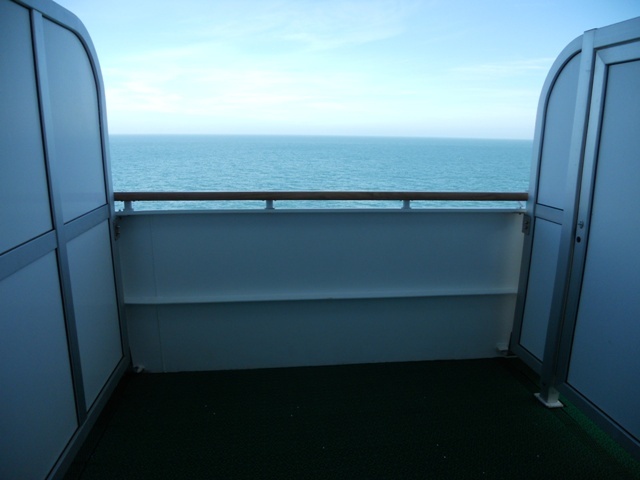 If you cannot find the stateroom you are looking for, please see "What do the obstructed views look like on Ventura?" as the ships have similar views. 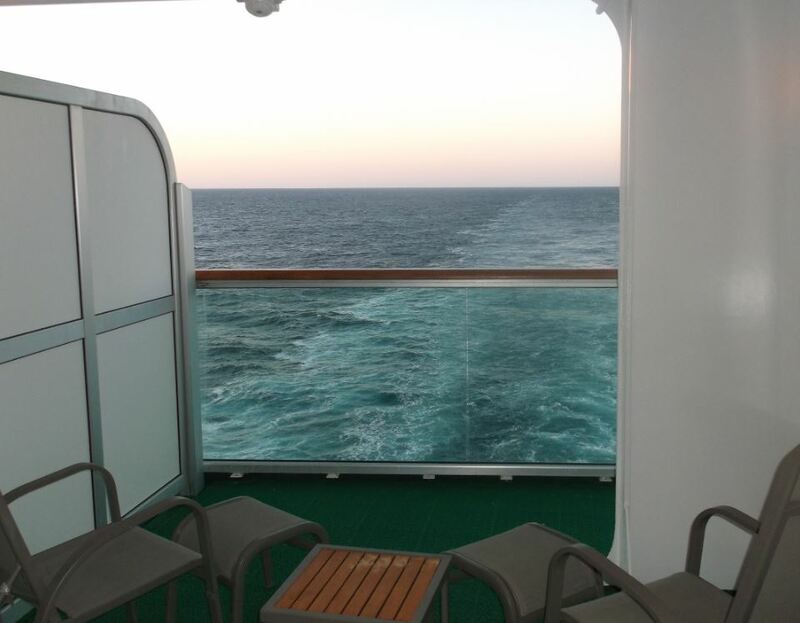 Obstructed view cabins on Azura are classed as MB, MC, ME, MF, NB, NC & NF grades on Lido and E Deck. 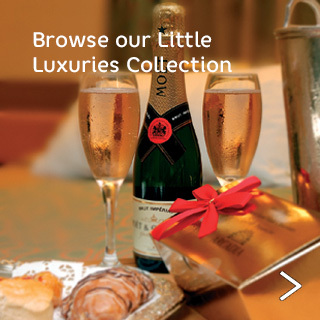 To make a booking for this type of cabin on Azura, please book online, call our Customer Contact Centre on 0345 355 5111 (local call charge apply) or speak with your preferred ABTA bonded travel agent. What do the obstructed views look like on Arcadia? What do the obstructed views on Aurora look like?